In kindergartens and schools in Norway, it is quite common to have something called a "nissedag" at some point during advent. 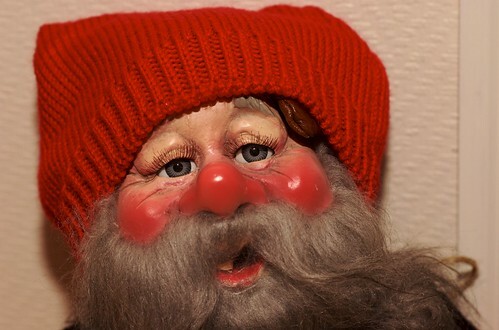 "Dag" means "day", and a "nisse" is a mythical creature thought to live at farms. They would do some sort of unspecified good deeds (at least if they were kept happy, by giving them some rice pudding from time to time), but generally be very elusive and only move about at night (a common trait among mythical creatures, as they would otherwise just be creatures). I guess you could say the nisse is more or less the Scandinavian version of the brownie. A nisse is traditionally seen as smaller than a human, I'd say about half to one third the size of grown person, and they are usually pictured with white beards, and wearing traditional clothing such as a knitted sweater, plus fours (made from coarse grey wool, not tweed), woolen stockings and a red hat (after brushing up on my hat related vocabulary at wikipedia, I'd say it's similar to a Phrygian cap), so essentially old fashioned skiing gear. And this is precisely what people will dress up like at a nissedag (though in general you would get away with putting on a red shirt). But why this weird tradition of dressing up as mythical creatures, and how is this releated to Christmas? så god og søt, så god og søt. for julegrøten vil han gjerne ha. because he really likes Christmas rice pudding. I think it's becoming increasingly more common to go to a nissedag dressed up in some sort of pre-made, Coca Cola inspired Santa Claus costume, but the last time I attended a nissedag (which must be something like 13 years ago), the majority of those who could be bothered dressing up at all was still going for the traditional look. Also, I mentioned earlier that an adult will often dress up as Santa and hand out candy at a juletrefest. It is also quite common to go for the traditional nisse look in this situation, sometimes complete with cross country ski shoes for good measure (the idea probably being that anything related to snow must surely give extra Christmas points). For the foreigners, a picture. But he's a traditional trickster, and like any trickster he has a soft spot. He's a real sucker for sour cream porridge, and for some reason one simple serving of this very basic meal on Christmas eve will keep him satisfied over Christmas and into spring, when people stop believing in him so much. And he will of course tell your animals that you are a kind and generous master deserving of their dedication and so on. In other words, he's a mythological mediator between the farmer and Nature in times of hardship, just like any god demanding its offerings. And the worst time of hardship for a mediaeval farmer in Norway would of course be Christmas, when he would suffer a diet exclusively made up of food preserved in mediaeval ways. No wonder they put some of it out on the doorstep to secure a bountiful spring.